It seems as though recently, more and more useful apps are opting to stick an icon in the menu bar rather than add an icon to the Dock. On my main Mac, between a few of Apple’s own menu extras and a slew of third-party utilities, I’ve got 22 icons on the right-hand side of my menu bar, and they’re all things I use daily. The drawback to this approach, of course, is that once you get enough systemwide menu-bar icons, the menus of traditional apps start to cover them up. This is especially the case on smaller-screened laptops, such as the MacBook Air. The workaround is to switch to an application that doesn’t have as many menus—for example, the Finder. But if you have enough stuff up there, even apps with few menus cover up some of the icons. Back in late 2010, I covered NoMenuBar, a simple utility that does nothing except give you an app with a single menu—when you switch to NoMenuBar, it leaves plenty of room for menu-bar utilities. But a drawback of NoMenuBar is that since it’s a traditional application, you must click its icon in the Dock, or use OS X’s Command-Tab application switcher, to activate it. An alternative with a few more options is AccessMenuBarApps. Like NoMenuBar, AccessMenuBarApps is designed to display only a single menu, although in this case, that menu is even smaller—it’s just a little Yin/Yang icon. But AccessMenuBarApps provides a number of additional ways to activate it. You can, of course, click its icon in the Dock or use the Command-Tab application switcher. (Oddly, AccessMenuBarApps adds its own menu to the menu bar, which you can also click—you can't disable this icon.) 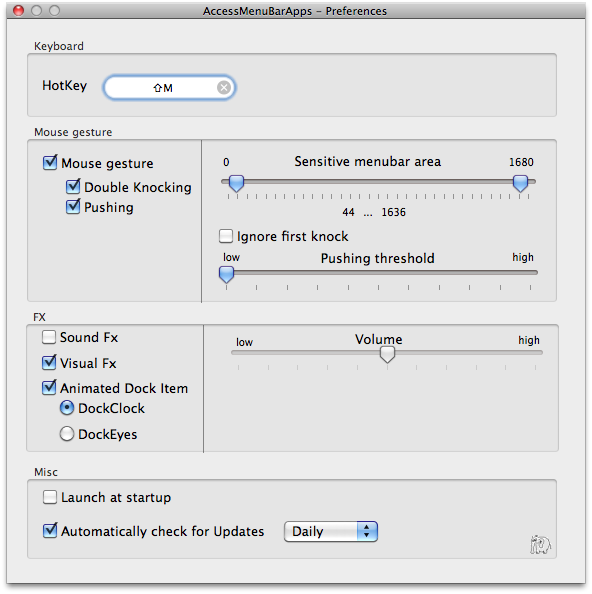 But you can also activate AccessMenuBarApps with a customizable keyboard shortcut or—perhaps the easiest method—by simply moving the pointer to the top of the screen. To keep this last action from activating AccessMenuBarApps whenever you want to access a menu or menu-bar icon, the program requires you to perform either of two gestures. The first is to bump the pointer against the top edge of your screen twice in quick succession. This sounds a bit odd, but it works well in practice—you just bump-bump quickly against the top of the screen, and when all your menu-bar icons are uncovered, the pointer is conveniently positioned to click one. The second gesture requires you to bump the pointer against the top edge of the screen and then continue pushing it up; AccessMenuBarApps activates after you’ve pushed a certain distance (configurable in the app’s preferences). Whether you choose double-bumping, pushing, or both, you can also choose whether these gestures work across the entire menu bar, or just a specific section of it. AccessMenuBarApps’ preferences window displays a slider with a pixel range equal to the horizontal size of your display (in the case of my 27-inch iMac, from 0 to 2560); you just choose lower and upper boundaries for the target area—for example, on my iMac, 1648 to 2560 is roughly equal to the section of the menu bar containing all my menu-bar icons. A nice touch is that these mouse gestures work even when you’re dragging files or content, so if you’ve got menu-bar utilities that support drag and drop, you can use AccessMenuBarApps to reveal those icons during a drag operation. Just as you can’t disable the program’s menu-bar icon, you can’t disable its Dock icon. But at least the developer has made the latter icon useful or entertaining: You can choose to have it display an animated clock or an Eyeballs-like set of eyes that follow the pointer around the screen. Thanks to AccessMenuBarApps’ multiple methods for activation, it feels less like a one-menu app that you switch to in order to see all your menu-bar icons, and more like a nifty utility that provides a number of ways to view your full menu bar.